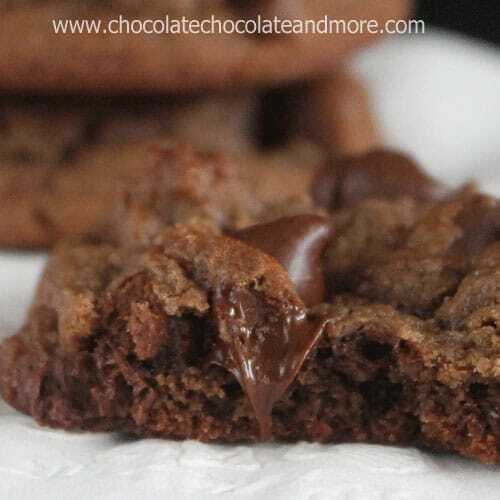 Chocolate Malt Cookies with Chocolate Chips - Chocolate Chocolate and More! Chocolate Malt Cookies with Chocolate Chips-the perfect treat with a ice cold glass of milk. What do you do when you have a plumbing problem and you know the plumber will be arriving in a few hours? You make cookies. The best cookies you can think of. For him. You make decadent Chocolate Malt Cookies with chocolate chips. We’ve had a wet spot on our carpet for about a week. My hubby kept trying to blame the dog but trust me, if our dog was able to pee enough to make a spot this big, she’s got some serious issues. I knew it wasn’t the dog. But we couldn’t figure it out. Every morning, the spot would start out dry and by evening, it’s be mushy wet. We thought maybe a pipe was leaking, but leaking up? There was no water damage on the ceiling below the spot. This went on for days. Finally, I don’t know what possessed me to look under the kitchen sink, but I did. Sure enough, every time we turned on the water, it was leaking…bad. So I call our local plumber, he comes right out, fiddles around a bit, determines the problem is the faucet hose. tries to fix it with a new washer, nope. Gonna need a new faucet. That settled, we gossip about everyone in town for a bit, when I ask him what do I owe? “No charge, I’ll see you tomorrow after you get your faucet.” This is not a friend of ours. Mr. Emmet and I had never met before, but we both knew of each other. This is just how things are done in small towns. I wanted to make Mr. Emmet something to show my appreciation I thought about cinnamon rolls but didn’t know what time he’d be here. Cold rolls just don’t say thank you like hot ones would. And I couldn’t be baking while he was working, I’d be in his way. It had to be cookies. Still baked fresh that morning. I think he was a little surprised but when they left I had 3 bags of cookies all wrapped up and ready for them. Of course Mr. Emmet had to stick around a bit and chat just a little longer. These cookies stay soft and are oh so good! Cream butter and sugars together, about 2 minutes, until fluffy. Add in eggs and vanilla, beat again. Whisk together in a separate bowl, flour, baking soda, salt, cocoa and malted milk powder. Gradually add flour mixture to butter mixture blending till all combined. Stir in chocolate chips. YUM. Will have to make these this weekend! That is just the sweetest story!!!! And omg these cookieslook so chocolatey and so perfect!!!!! These cookies look like chocolate perfection! Visiting from the Keep Calm and Link Up party … these cookies look insanely YUMMY!! Thanks for sharing 🙂 Pinning!! Those cookies look great! I’m going to have to put malted milk powder on my list and try them. You know, I never enjoyed growing up in a small town and couldn’t wait to escape to the big city in another state! After about 10 years of living in some of the larger cities in the US, I came back home with a new appreciation for the “interested” people I used to think of as just plain “nosey”! Yep! Had a similar plumbing issue that resulted in the warped hard wood planks in our kitchen. Great story and great cookies. Your pix are sooo beautiful! I wish I could get that kind of service! And a big plate of these – yum! I’d love for you to come and link up at Taste and Tell Thursdays! I am a huge fan of chocolate and malt! Love it in everything. Oh wow these look dreamy! A big Valentine’s Day box of these babies and I’d be in heaven this year. I just had an actual chocolate malt for the first time in years and I loved it so much I was going to make my own.. I’ll have to bake a batch or three of these while I’m at it. These cookies look so yummy! My daughter would love these! She’s a chocoholic! Oh WOW! Pinned! Got to make these – they look wonderful! You have one lucky plumber! These cookies look and sounds divine. You had me at malt. I love malt! Making these soon!!! now your plumber is a lucky one, and speaking of leaks under the sink I have one too, i noticed it a few days ago and right now I have a bucket underneath it until I can call the plumber later this week. The cookies look great, the more chocolate the better! What a sweet thing to do for the plumber…I bet you made his day! 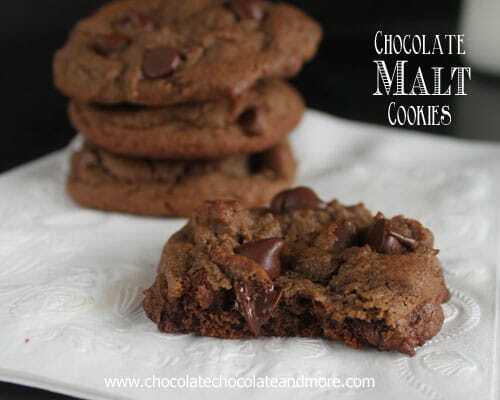 I never think to put malted milk powder in my cookies–what a great idea! Love this story Joan! Just goes to show, you should always show your guests- no matter who they are, good hospitality! 🙂 And I love these cookies, you can’t go wrong with a chocolate malt cookie! YUMMY! These look really good. 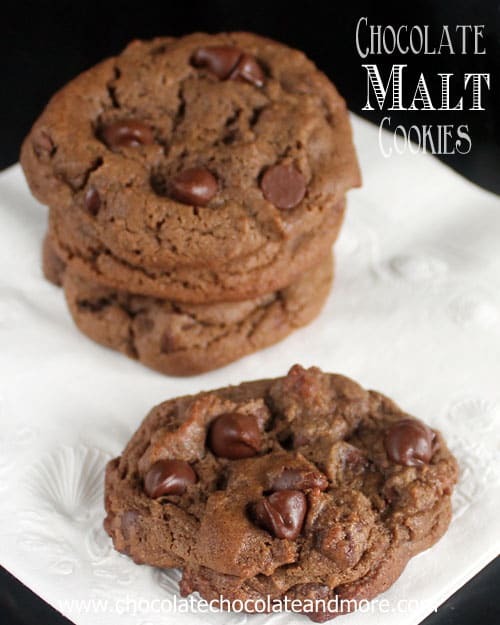 I’m looking for a malt cookie recipe and I’m glad to see that contain plenty of malt in them. Do you happen to know what weight your bag of chocolate chips was? Laura, I used the regular sized bag, 12 ounces. These look great. Did you use dutch-processed cocoa or regular cocoa? Hi Tina, I used regular Hershey’s Cocoa. They came out really well. Thanks for the recipe! My husband loves chocolate malt flavored anything! I’m dying waiting for weekend so i can try your recipe! It sounds like your baking soda was flat. You can test your baking soda but putting a small amount in some hot water, it should bubble up like a bubble bath. How many cookies does this make, with a medium cookie scoop? Thanks. This recipe will make about 4 dozen cookies. Enjoy! Thanks again. I also wondered whether dark cocoa powder can be substituted for the traditional kind, and whether the chocolate chips are required…? These look like they’re to-die-for! I have to add them onto my baking list! Hi! I was wondering if I can use chocolate malt powder instead. If so, do I still need to add the cocoa powder? Yes you can use the chocolate malt powder but I would still recommend adding the cocoa powder for a rich chocolate cookie.